Ailsa’s Travel theme this week is ‘Fruit’. 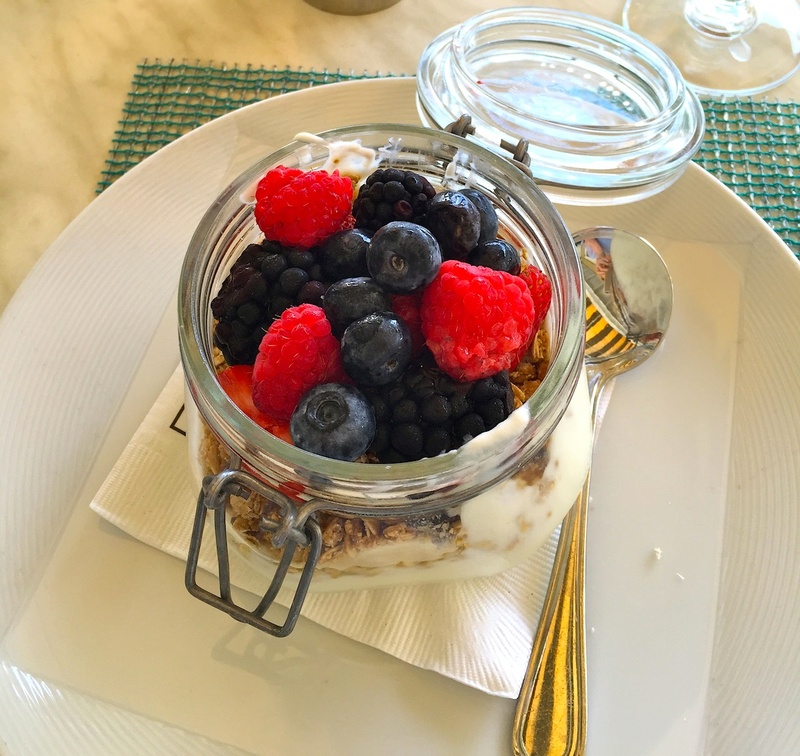 I love to eat berries for breakfast, and when we were in Key West a couple of months back, this is how they were served up, in a cute glass jar with granola and yoghourt underneath. Just looking at the photo brings back such great memories of an idyllic few days spent with our son and three little grandchildren. Fruit is the main features in my breakfast. Your grand children will thrive on that kind of breakfast. That is such a cute way of serving the dish! I love it! lo so che sei molto golosa e questi frutti di bosco sono davvero invitanti! Healthy, delicious and served so beautifully! Those berries look very tasty, Sylvia. It’s not hard to imagine why this is your favorite breakfast, yum! Yummy! I love eating berries for breakfast too. Dude … That looks like something I should have eaten today …. Ahhhhh but there were no berries in sight. Not even bananas … Just cereal. What an awesome morning food. If you can’t mange it all slide it across! I love berries and granola and yoghurt and this looks very yummy! I love the presentation of this Sylvia. I have certainly seen this layered look but the little jar provides an added touch! Mmmm I need a snack now. I’d want to keep that jar. I love it! How was it to eat out of? Cause although it looks cool it seems like it would be difficult to spoon the contents out of, especially that on the bottom. I love berries. We grew enough strawberries and raspberries on our allotment this summer, to have berries for breakfast every morning for a month. Now I’m into new season organic blueberries shipped from the southern hemisphere (unfortunately), along with my tropical bananas. It’s all very well people saying we should eat local seasonal fruit, but I don’t really fancy the rowan berries growing on the tree outside my window! Yes, we have berries available all the year round in the UK stores but, more often than not, they’re imports. Yummy, that’s one of my favourites too! Such an inviting presentation. I know it tasted as good as it looks! Who knew that ordinary jars would be used for so many attractive purposes? hmmmmmmmmm delicious.lovely way to offer them. Mouthwatering. I can scarcely wait for our fresh fruit and berries to start coming into the market. A worthy part of any meal. That looks so yummy, and so colorful! Thanks, Jill. Yes, I would have had it again, but it was our last day there.